Sirius used a plug-in package construction. It was a serial machine with a 500kHz clock. Input and output was by punched paper tape. The mainframe accommodated 1000 40-bit words of store and nine accumulators. Additional 3000-word store cabinets could increase the store to a maximum 10,000 words. Most customers would need a 4000 word system. Sirius developed from an earlier machine called “NEWT”, an in-house engineering test-bed for two Ferranti technological innovations: nickel delay lines using torsional oscillations (see Gordon Scarrott’s article in Resurrection 12) and a novel logic design style called ballot-box logic (more about this in the user guide). These innovations made their first appearance in Sirius but were intended for use in the much larger Ferranti Orion. Although the graphical user interface of this software emulates the appearance and controls of Sirius, under the surface lies a gate-level simulation of the logic hardware, running continuously. It runs much more slowly than the real thing but fast enough for demonstration purposes. A software oscilloscope is built in. This was a useful tool during development of the model (no wiring list had been found at the time and there were some obvious errors on the schematic diagram which needed to be analysed and corrected). The Sirius II logic diagram is supplied (in a .tif file) and the oscilloscope can still be used to probe the hardware logic design while it is running. It requires a PC running Microsoft Windows. 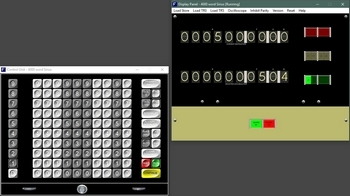 The simulator was largely written before 2005 (using an already old compiler) but still runs on Windows XP, 7 and 10 (and probably intermediate versions). It may struggle on older or slower PCs. user-guide.pdf. This is the user guide for the software. The first few pages give a general overview. sirius-basic.zip. This contains the simulator and a simple step-by-step worked example. It doesn’t need to be installed. Extract the contents of the zip file into an empty folder on a Windows PC and run it from there. The included README file explains how to get started. This set of files is sufficient to see Sirius running. sirius-extra.zip. This contains Ferranti programming manuals, more worked examples (including a genuine application from the 1960s) and the logic diagram for use with the simulator's built-in oscilloscope. One of the programming manuals explains more about the Sirius computer and its operation. Extract the contents of this zip file into the same folder as the basic files. A second README file is included to explain how to continue.